This smoothie features three superhero foods, beetroot, blueberries and cherries, to boost endurance and minimise exercise-induced muscle damage for quick recovery. Beetroot is rich in natural nitrates, which have been found to boost performance during sporting activates, in particular those requiring endurance and stamina. In fact, scientists have found that runners who ate beetroot before a race ran faster. Beetroots seem to widen blood vessels, allowing more blood to flow to muscles and reducing the amount of oxygen needed to perform aerobic activities. 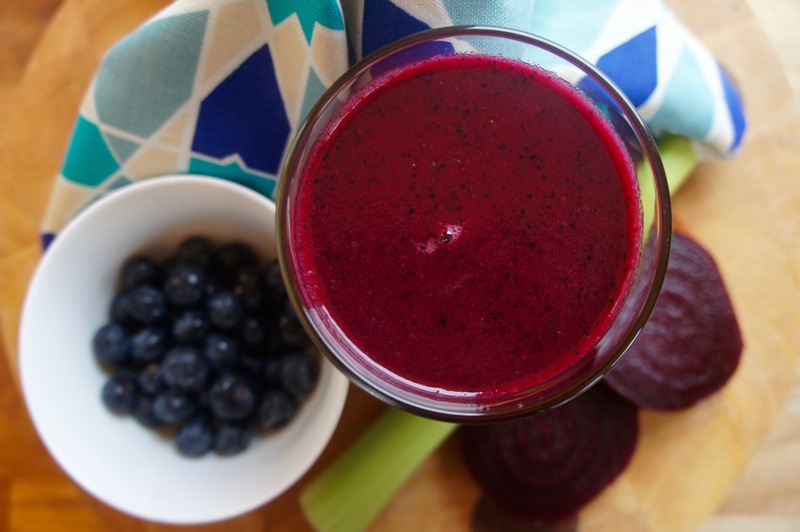 I use cooked beetroot in this recipe, because it makes for a creamier, smoother drink. Raw beetroot tends to bring a fibrous quality to smoothies, which some don’t like. I find the easiest way to cook beetroot is to boil them whole, in their skins, for about an hour until tender. Then leave to cool, the skin will slip off easily but I recommend wearing rubber gloves otherwise your hands will turn bright pink. Then store in an airtight container in the fridge, they keep for a few days. Montmorency cherries and blueberries are both powerful sporting super foods, rich in polyphenols such as flavonoids and anthocyanins known for their anti-oxidant and anti-inflammatory properties. These polyphenols have been found in research to prevent exercise-induced muscle damage. Studies have found that strength loss and pain were reduced after drinking Montmorency cherry juice concentrate, and that post-run inflammation was reduced more in those who took cherry juice for five days before a Marathon than in those taking a placebo, and isometric strength recovered significantly faster. The easiest way to benefit from Montmorency cherries is by consuming Cherry Active concentrate, available widely from health food stores and some supermarkets. Simply place all ingredients into a blender and process until smooth and creamy.